What is a Colorado Eviction Notice? Colorado Eviction Notice: What Is It? A Colorado eviction notice is used by a landlord or property management company when the tenant of a rental property violates the lease in some way. One of the most common reasons is failure to pay rent. An eviction notice is more commonly known as a Demand for Compliance or a Right to Possession Notice. They may also be known as a Notice to Quit. An eviction notice must be given before a landlord or property management company can start the legal process through the court. What Are the Components of a Colorado Eviction Notice? Although non-payment of rent is technically non-compliance with the lease provisions, they’re often addressed as separate matters. With a 3-day notice, the tenant has three days from the date of the notice to pay their rent or correct the violation. This Colorado eviction notice is subject to Colorado landlord-tenant law notated as Colo. Rev. Stat. § 13-40-104(d). If the violation is unpaid rent, the notice must list the amount that is due, when it should be paid, and where it should be paid. 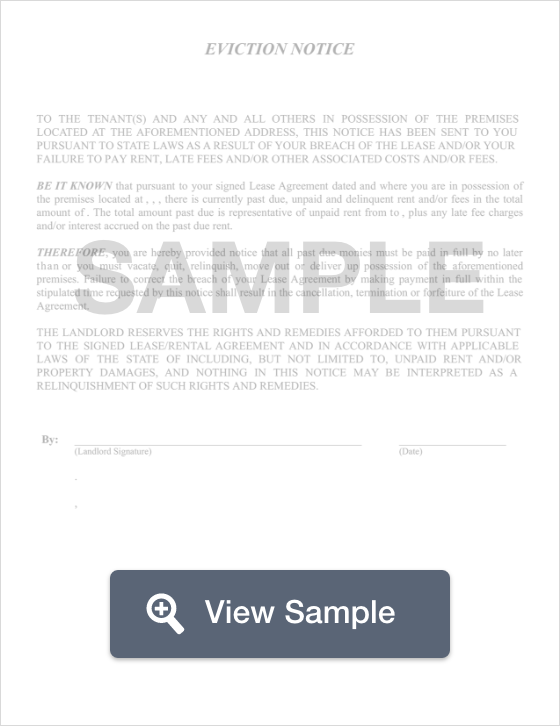 If the violation is a different sort of violation of the lease agreement, the notice should explain the nature of the violation that caused the eviction notice to be issued. It should also list the date by which the violation must be corrected. What Are the Legal Considerations of a Colorado Eviction Notice? Colorado eviction notices must be written in compliance with Colorado landlord-tenant law. They must also include a certificate of service that is dated and signed by the person who serves the notice. Landlords may not begin the court process of eviction without first issuing a written eviction notice. Also, not all evictions are legal. Landlords may not evict a tenant because the tenant has reported the property for code violations. Landlords may not evict tenants for discriminatory reasons. They also may not rely on self-help methods such as changing the locks or shutting off the utilities. If you live in Colorado and receive an eviction notice, read it carefully. Make sure that you understand why you’ve received it. If you have questions, call your landlord or the property management company. If you want to remain on the property, take the appropriate actions before the deadline. If you think that the landlord’s attempt to evict you is illegal, talk to a landlord-tenant lawyer. If it is, you may have the grounds to file a lawsuit against the landlord. Many law schools offer low-cost or free legal clinics where they help tenants with eviction notices and other problems. There are also legal aid clinics that may be able to help you if you cannot afford a lawyer. Colorado landlords must comply with landlord-tenant law. This include providing an eviction notice. A landlord cannot file a complaint with the court without having first served the tenant with an eviction notice. Landlords may not subscribe to self-help measures to gain access to the property. Those measures were described above under Legal Considerations. If a landlord or a property management company needs to learn more about their options, they should speak with a landlord-tenant lawyer.